In our second annual marketing survey, we surveyed CMOs in The CMO Club about their use,expectations, and measurement of social media, then compared the results to the previous year’s survey. 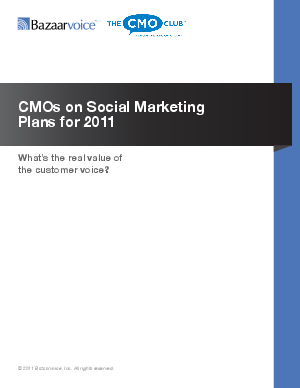 In short, 2009 marked the year CMOs embraced social media marketing but struggled to tie their strategies to the bottom line. Many evaluated engagement metrics created from social media— such as the number of click-throughs to the website or number of fans or followers — instead of evaluating business metrics like revenues and conversion. In 2009, CMOs aspired to tie social to the bottom line. In 2010, CMOs reported similar challenges in tying social media to revenues. In 2011, revenues remain critical, but the additional value of these consumer interactions — even beyond the site —lies within the key insights customers share with brands. These aggregated insights, when analyzed and put into action, create value far beyond the marketing organization, impacting products, vendor relationships, and corporate strategic initiatives.